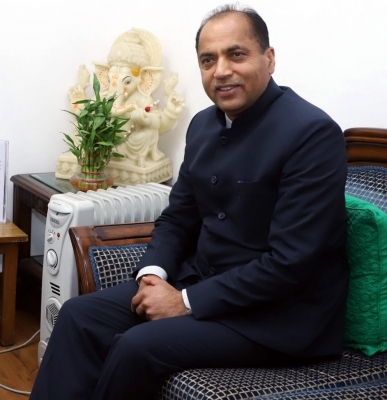 Shimla, Feb 13 (IANS) Facing the challenge of retaining all the four Lok Sabha seats, Himachal Pradesh Chief Minister Jai Ram Thakur says he is not being dictated to by the RSS and that he enjoys a free hand to lead the party in the coming elections. For him, development work and no witch hunting is the mantra. "This accusation (of RSS remote controlling him) does not have an iota of truth. "Our central leadership has reposed full faith in me and has given a free hand to run the affairs in the state. The RSS is an apolitical nationalist organisation, which has nothing to do with state affairs," Thakur told IANS in an interview, dismissing rumours in political circles that he is being dictated by BJP ideologue Rashtriya Swayamsevak Sangh (RSS) and party's senior leaders. Five-time legislator Thakur (54) was elevated after the BJP's chief ministerial candidate, Prem Kumar Dhumal, suffered an abject defeat in the 2017 assembly polls. Several names were doing the rounds at the time, including that of Union Health Minister J.P. Nadda, whom the party did not relieve from national politics. "I don't think there is anything wrong in seeking the advice of Dhumal and Nadda, on any regarding matter related to the development of the state," Thakur stated categorically. On getting free hand from the high command to lead the party in the elections, Thakur, who has won his fifth consecutive assembly election, said: "The elections are fought with collective efforts and with collective strategy. Being head of the state I would have greater responsibility to motivate the rank and file to ensure the party's victory." "I am fully confident that the BJP will retain all the four Lok Sabha seats (from the state) in the General Elections," Thakur added. Carrying out development on the debris of decades of vendetta politics, Thakur said the BJP has brought a generational change in the state politics. "This change has brought new ideas of governance. Shunning the politics of revenge and counter accusations, we have put forth development as our guiding principle in reforms. We have taken several new people-centric initiatives in 13 months," the plain-speaking Thakur said. The first-time Chief Minister, who has 11 ministers -- half of them first-timers, believes the biggest achievement of his government has been winning over the confidence of the people. "The government from the day one started working with a sole aim of development and welfare of the people. My government is working without any vendetta and vengeance towards our political opponents." The state, he said, has implemented several decisions and schemes which are bound to transform the economy and the people. "The Jan Manch (public meeting in every district headquarters on first Sunday of a month) programme launched by us has been appreciated even by our political opponents. "Till date, over 33,966 grievances of the public have been redressed in 106 Jan Manchs. Similarly, the very first decision of the government to lower the age limit of senior citizens for availing old-age pension without any income criteria from 80 to 70 years have benefitted over 1.60 lakh people," he said. Thakur, who rose through the ranks, believes establishing direct contact with the common masses will definitely help his party retaining four Lok Sabha seats in the ensuing General Elections. On the central leadership reposing faith in him and his first-time cabinet colleagues and bringing generation change in the state politics, he said: "Yes, I agree that the Vidhan Sabha elections results of 2017 brought in a generation change in the state politics. Since all my cabinet colleagues are young and have a new vision and new vigour, this would definitely help progress and development of the state." "I did not face any challenge as such during the last one year. But still the major concern before me has been to bring back the derailed economy of the state back on track and understand the developmental aspirations of the people. For this, I toured 65 (of the 68) assembly constituencies during this one year to understand the developmental needs. "I am sure that after a year in office now I am more clear and precise about the expectations of the people," he said. The Himalayan state, whose hydropower generation as well as horticulture and tourism are major contributors to the economic development, is facing one of its worst financial crises - with its loan liability at nearly Rs 50,000 crore. "We have inherited a loan burden of over Rs 46,500 crore from the previous government due to their financial mismanagement and unmindful expenditure. Therefore, the biggest challenge before us was to bring back the derailed economy back on the track." "It is true that due to limited financial resources of its own the state has to heavily depend on financial assistance and loans from the Centre and external funding agencies. Still soon after assuming the office in the state, the government took some concrete steps to stop wasteful and unproductive expenditure, besides striving hard to create its own resources for income generation."